“The 2013 report estimates the size of the economic activity in the property sector in terms of annual income and expenditure flows generated by the sector,” it said in a statement. “The study showed that the property sector contributes R191.4 billion to the SA economy.” The council released the findings of “The Impact of the South African Property Sector on the National Economy” on Tuesday. The research continued from the 2012 report which measured the size of the property market in the country at R4.9 trillion. In 2012, research showed that the total economic contribution of residential property to the gross domestic product was R103.7bn and it contributed R20.1bn to the fiscus through various forms of tax, the council said. It said the analysis in the latest report used the life cycle of a property. Council CEO Portia Tau-Sekati said detailed research was carried out in various phases to provide a valuable understanding of the sector. “The property sector makes a significant contribution to the country’s economy and it is important to pursue this research to its conclusion for several reasons,” Tau-Sekati said. “Aside from the fact that no reliable figures have existed on the size and impact of the sector before this, in a sector this big and this important as property there should be ample opportunity for transformation to take place.” Tau-Sekati said the first phase measured the size of the property market, the second its financial and economic revenue and the third, which was underway, measured and analysed the transformation using the broad-based BEE tool with eight elements contained in the property sector code. On 11 October 2013 the Minister of Trade and Industry, Dr Rob Davies, gazetted the revised Broad-Based Black Economic Empowerment (BBBEE) Codes. The new Codes will replace the existing BEE Codes of Good Practice when they come into operation. Increasing the thresholds for exempt micro-enterprises, qualifying small enterprises and large entities; The introduction of the so-called priority elements: ownership, management and control as well as enterprise and supplier development; and Introduction of the new system of enforcing compliance, through the discounting principle that is applied in respect of those entities that do not meet the minimum thresholds on the priority elements. The new revised codes of Good Practice have introduced- Priority Elements to ensure more focus and more efforts in particular codes/elements. There are 3 priority elements: Ownership, Skill Development and Enterprise and Supplier Development. Generic companies need to comply with all 3 priority elements and QSEs need to comply with only 2 of the 3 priority elements with ownership as a compulsory. The sub-minimum requirement for Skills Development is 40% of the total weighting points for Skills Development. The sub-minimum requirement for Enterprise and Development is 40% for each of the three categories, within the Enterprise and Supplier Development element, namely preferential procurement; Supplier development and Enterprise development. Non-compliance in any, some or all of the above, brings to effect the Discounting Principle. This research continues from its 2012 report, which measured the size of the property market in South Africa at a massive R4,9 trillion. It was and remains the first study of its kind in the country. The 2013 report estimates the size of the economic activity in the property sector in terms of annual income and expenditure flows generated by the sector. The study showed that the property sector contributes R191.4 billion to the SA economy. A key finding of the research shows that in 2012, the total economic contribution to GDP of the residential property sector was R103,7 billion in 2012, while it contributed R20,1 billion to the fiscus through various forms of tax. 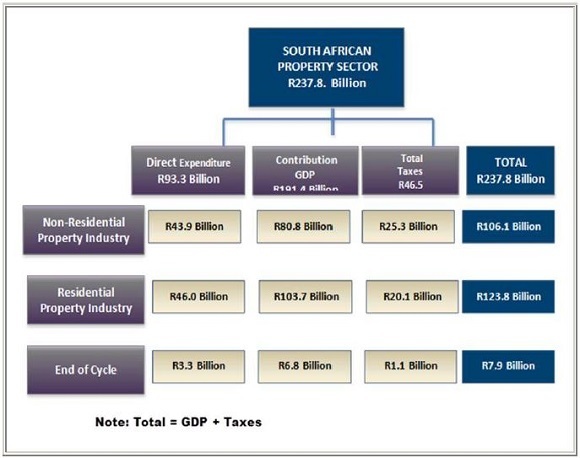 On the other hand commercial (non-residential) property sector contributed R80,9 billion to GDP and R25,3 billion to the fiscus through various forms of direct and indirect taxes. The analysis in the latest report uses the life cycle of a property, from origination concept to its end cycle. The total contribution to GDP of the end of cycle stage in 2012 was R6.8 billion with R1.1 billion being contributed to the fiscus. The research also considers the financial revenues attributable to the existence of the property during its life cycle and looks at buildings from an 'object' and an ‘investment asset’ perspective. CEO of the Property Sector Charter Council, Portia Tau-Sekati says: "The property sector makes a significant contribution to the country's economy and it is important to pursue this research to its conclusion for several reasons. Aside from the fact that no reliable figures have existed on the size and impact of the sector before this, in a sector this big and this important as property there should be ample opportunity for transformation to take place." Tau-Sekati explains that detailed research is being carried out in various phases, with each phase providing a valuable understanding of the sector and ultimately creating a consolidated body of knowledge about the property sector that will foster a consistent understanding of the sector for measurement and evaluation. The first phase measured the size of our property market and the second its financial and economic revenue. The third, currently underway, measures and analyses the transformation using the Broad-Based BEE tool with eight elements contained in the property sector code.